Alado furlers have self-contained double halyard sheaves to allow fast sail changes and downwind sailing with twin genoas. Existing sails can be used after simple conventional adaptation. The halyard is led through the sheave, returned and made fast to an eye on top of the drum. As there are no hanks, high halyard tension is not required and no halyard loads are applied to the mast. No swivels are used. This eliminates the possibility of halyard wrap, which can produce a tourniquet effect, leading to forestay parting and mast collapse. 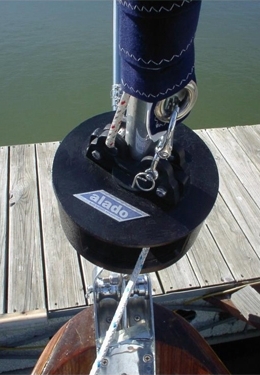 Alado furlers are designed for owner installation and uses the existing headstay without modification. Load-distributing polypropylene bushings center the headstay to eliminate galvanic corrosion, friction, wear, and noise. Polypropylene pins fix the bushings. There are no screws and no glue necessary. The heavily anodized, extruded marine aluminum alloy foils are furnished in 5' lengths. Opposing sections dovetail into each other and overlap longitudinally forming a true aerodynamic profile with high torsional strength. 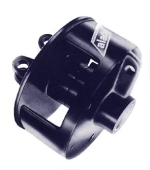 To remove the risks of jamming and failure Alado furlers have minimized the number of moving parts and eliminated attachment points to the standing rigging. Ball bearings and swivels subject to tension are not used. The solid but open drum provides easy access to the furling line and revolves freely around the headstay. The furling drum, sheave boxes and luff feeders are manufactured from cast aluminum alloy with the added protection of heavy anodization and thermo-electrostatic paint. Copyright © 2018 ALADO. All Rights Reserved.